One of the things I’ve always found being really complex was component reuse. This means to use one app inside another. In this blog series, I will try my best to demystify this, as it really isn’t that hard at all. First of all, why would you even want to do this? Well let me try to explain. As you probably know, developers are lazy and if we can reuse previous generated code for other apps, not only is it smarter, because we only change in one place, but also much more effective of our precious lazy time. As an example, I am working for a customer right now, where the search helps we use in the app are other independent apps and also we are building extensions to My Inbox workflow items, that will be consisting of about 6 different apps, one for each tab in the app. Sounds complicated right, but hopefully by the end of this blog series, you’ll realise that it really isn’t. Taking your component reuse to a whole new level! MyChildApp doesn’t really have anything special, but I’ve added a view with a hard coded text for now. Now deploy our first app to SAP Cloud Platform, otherwise this won’t work. Also keep in mind that for your reuse applications, you need to deploy your changes to see them, WebIde can’t pick them up from an undeployed app. MyParentApp also has a simple view with a similar text and then I’ve added a component container. When you read the documentation about component reuse, you will realise that you can’t initialise another component without a component container. <mvc:View controllerName="bourneMyParentApp.controller.View1" xmlns:core="sap.ui.core" xmlns:html="http://www.w3.org/1999/xhtml" xmlns:mvc="sap.ui.core.mvc"
Now the magic happens in two specific files, when you are working in SAP Cloud Platform (SCP), the component.js file and the neo-app.json file. The first registers the namespace and name of my child application and the path to the app. The second initialises the component. Now for the neo-app.json file, the way SCP works is really via this file, you use it already for pointing odata calls through your cloud connector to your backend system. Now we have to do a similar thing, so when SCP sees that particular URL pattern, it will be routed to where we point it to. 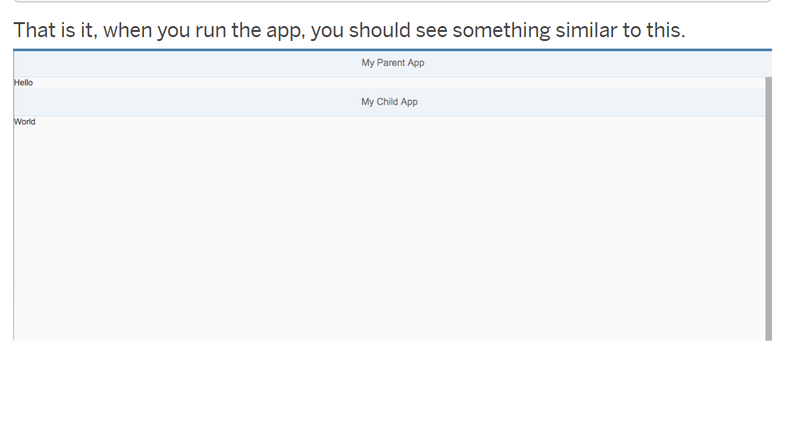 In my example it is the path for /mychildapp/ that is pointing to an application deployed on SCP named mychildapp. That is it, when you run the app, you should see something similar to this. Alright now for our second course of actions, which is slightly more tricky, how to use a shared library. For more info on that topic, have a look at this blog. The idea for a shared library is that if you have custom controls or maybe a formatter or other shared functions, you can store them in a shared library that can be used by multiple apps. In my example I will show both usecases. Firstly I have added another textfield to my view in the parent app, where I want to use a formatter. Now in the view controller is where i declare my formatter. Now we need to make SCP recognise that path, we do this again in the neo-app.json file. Please notice that we need to use the resources path here, as SAPUI5 automatically will look in that folder to try and find our library. Also we need to set the entrypath of our library to the root. I’ll explain why later. Alright, to extend the example I will now add a custom control into the child applications view. REMEMBER to redeploy your application. Otherwise you won’t see the changes. Now for the library. Create a new folder in your workspace and name it “MySharedLibrary”. Copy a neo-app.json file from your parent app as well as a manifest.json file to the folder. Everything else is also vanilla. In here, we keep a reference to our ProductRating custom control, the formatter is independently referenced. Now deploy your application to SCP and try and test your parent application. It isn’t pretty, but that wasn’t the intention. Hopefully this gives you the necessary explanation of how you do component reuse. your jquery calls to register your nested component. The library.js and .library file as well as declaring a library as type in the manifest.json file of a library. My next blog will be about how we can now share data between our applications, because right now they are running independently of each other. A very comprehesive blog on an important topic. Thanks Jakob! In my opinion component re-use is rather under-documented and not often discussed. A key point is that as well as eliminating code duplication it leads to a more consistent user experience too. Very nice blog. Thanks ! But how to load different components dynamically without listed all the paths of possible components in the neo-app.json file? Because if new reusable component developed, we can get the component info like its name from back-end service, but the front-end need to add the path to the neo-app.json and redeployment. So that maybe hard for maintaining with front-end. Thanks ! The problem seems do not exist If the apps deployed to ABAP Server. Looking forward your next blog! I did similar but when i tied to run the application from Fiori Launchpad its giving Error. Fiori Launchpad is generating wrong URL. There is a small change in ” registerModulePath “. Thanks so much! I’m now reading the code. It’s really nice. I really want to thank you for the effort in doing this blog, this clears many of the questions I had, just one doubt, if I want to do the same with openui5 deployed in an apache server, what would be the replacement of the neo-app.json in this kind of app’s to reference the another app. Sorry for not getting gnback to you earlier. You should be able to do something similar to on the abap stack. So you need to declare the paths as they are hosted on the Apache server. Then it should be fine. Thank you Jakob!, simple :). Many thanks for such a detailed blog. I was able to create a reusable library on SCP using the steps mentioned in this blog. I am facing couple of issues. Appreciate if you can give some insights. 2) How can this library be used for apps deployed on SCP’s portal? Hi fazal, I had the same issues. As I recall you need to declare the name space specifically for the library in the resource path. IT would be your resourcepath that needs to tweaking or your neo-app.json file. RIght now you go two sub directories up. Thanks for a comprehensive blog. When deploying mySharedLibrary to the ABAP repository I am getting error “Unknown project guidelines”. Am I missing something? Hi Jacob, I´m trying to create an app like yours, but the component of child app is being read from “<server>/sap/bc/zbsp_app/Component.js”, so no file is found. Check Christian s reply. That should help you. You need the modulepath registered either in the manifest or in the beginning of your component.js file. I tried running the MyParentApp by following the instructions upto the point . I should have got something similar to the screenshot. But what I get is a popup saying the app could not be displayed. The error log is quite long. Here is some portion of it that might help us understand the error. Can you please help me out with what might be wrong here. I think something has gone wrong in your path decleration when you registered the app on the index page or maybe you have an error on your XML. 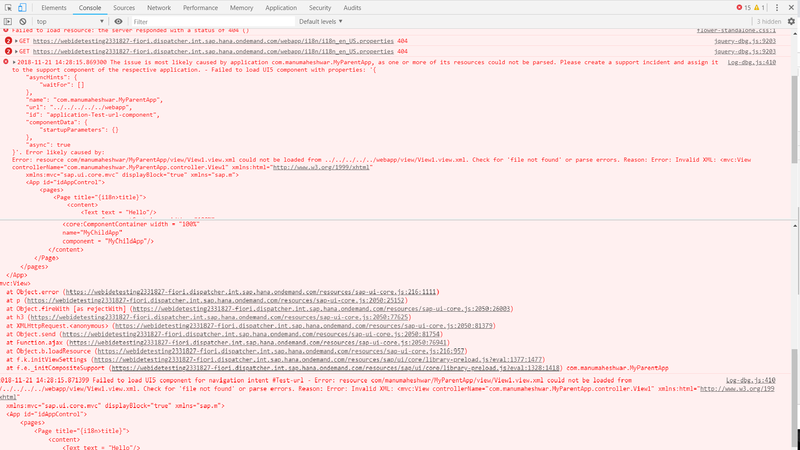 Please I need your help with something, I`ve already made the call to an app inside another app, but I’m troubleshooting with routing in the child app, every time I open the child app, goes directly to the Empty page (Empty.view.xml). You know how to resolve this?, The app runs well independently. Thank you in advanced, and I appreciate any help. That would be the pattern of your routhing that makes it navigate to the not found page. Also, how to instantiate the components on click events through the controller of the dashboard app? I suggest you publish this question on answers.sap.com, as it doesn’t have much to do with the content of this blog. I am trying to use “NW_APS_NTE_LIB” Notes for Application Object (ReuseLibrary) in one of the standard Fiori app by extending it. As you mentioned, I have added this reuse library in extended app component.js and neo-app.json files. Now, I am trying to bind the file from reuse library to the extended app. Can you please help me out to bind the reuse library to the extended app. <core:FragmentDefinition xmlns:core="sap.ui.core" xmlns="sap.m" xmlns:form="sap.ui.layout.form" xmlns:l="sap.ui.layout" xmlns:ca="sap.ca.ui"
Your blogs helped to implement a solution that really needed re-use, so I just want to appreciate you and appreciate the effort you put in making these blogs.